After a walk through the Athens food market, we'll investigate the National Archeological Museum where one can actually see the transition from pre-hellenic to hellenic aesthetics and culture. After a siesta, we'll hit the Temple of Zeus and take a lap around the Olympic Stadium (originally built as a Panathenaic stadium in 330 BC). We'll head out by private coach for a day trip to Delphi. After exploring the legendary sanctuaries to Apollo and Athena, we'll visit the nearby Delphi Archeological Museum to see three key artifacts. Lunch will be in a nearby mountain town on the way back to Athens. That evening, we'll catch a movie at one of the great outdoor theaters in the Plaka. We'll investigate the Acropolis Museum (one of the best museums in the world). We'll try out poetry (old style or slam) in the Theater of Dionysus, then walk through the ongoing excavation up the Acropolis including the Parthenon and the Temple of Athena. In the evening, we'll attend a concert at the world's oldest existing music venue, the Odeon. We'll head to the other side of the Acropolis to the Agora and Agora Museum, then have dinner in 'Souvlaki Row.' Depending on student interests, we'll continue to explore Athens and all its treasures (Museums of Musical Instruments, Folk Art, Children, Before dinner in 'Souvlaki Row' we'll assemble on the Pnyx (the real hill where it happened). In the evening we'll see "Socrates Now", an intimate one-man show with the philosopher himself. 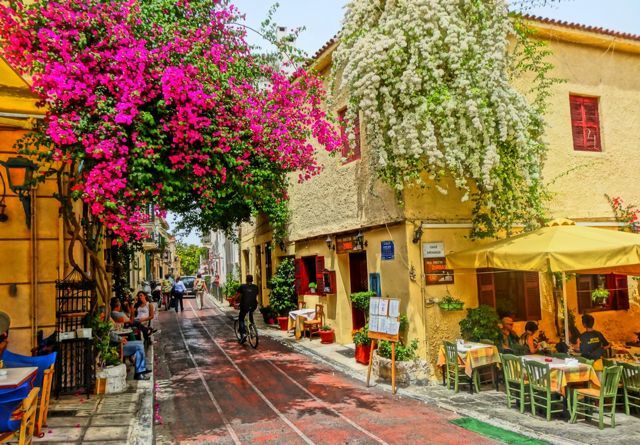 Via private coach, we'll take a long day trip through Corinth, Nafplio (the first capital of modern Greece), Mycenea (Agamemnom's turf) and the historical heart of medicine and theater, Epidaurus. We'll have a late lunch on the water followed by a swim on a secluded beautiful Greek beach. That evening, we'll attend a life performance in the oldest known theater in the world, Epidaurus. We'll check out of our hotel and take an early ferry to the island of Naxos. After we check in to our accommodations (Hotel Coronis), we'll explore the small, charming town center then head up to another beautiful sunset at the Temple of Zeus overlooking the harbor. We'll take a day cruise through the Cyclades islands. Delos, the birthplace of Apollo and Artemis, was the religious center for all Greeks. Mykonos, with its whitewashed churches and sandy beaches is one of most beautiful islands of Greece. After an easy lunch in the village center and a quick swim, we'll head back to Naxos for another fabulous sunset. The morning begins with a windsurfing lesson in St. George Bay just south of our hotel followed by some serious beach time. If interested, we can take an afternoon walking tour of some of the quaint shops and local museums in and around Naxos town. After packing, we'll take a tour up into the highlands of Naxos to visit an ancient quarry (one of the oldest in Greece), an aquaduct and the charming village of Halki, home to world-class artists and foods. In the late afternoon, we board a ferry heading back towards Athens and spend the night in the port town of Pyreaus. After a quick stop by the life-sized model of an ancient Greek Trireme (a ship paddled by 100 men), we head towards the airport for our mid-day flight arriving at Newark International Airport in time for dinner and July 4th fireworks.